Buying a used car is easy. Purchasing a good and reliable used car, is another story. Plus, valuable buying tips from professionals and chceklists to insure you get what you pay for. There was an old adage about not buying a vehicle that's manufactured on Monday or Friday, because more of the plant workers are absent on those days and those who were there were less attentive. Modern production techniques have changed this. A more modern adage is that you should avoid buying a vehicle built in the first year after a major redesign, especially if the engine and drivetrain are all new. Is this adage true? Well, in recent history there are a few examples of where "all-new" vehicles had some initial bugs that had to be worked out, but most have no more problems than subsequent years of the same design. Consumer publications such as Consumer Reports can help you identify vehicles that have problems by design. Never buy a car before driving it. If the owner or dealer balks, seriously question his motives. Sign nothing (it could be a sales contract!). And drive carefully. It's not your car yet! Drive slowly at first on city streets to get the "feel" of the car before heading for the highway. Get comfortable with the way the car steers and stops before driving it briskly. And take as much time as you need. If the owner or a salesman insists on accompanying you, don't let him distract you from the job at hand. Some savvy sellers will turn on the radio to mask funny engine noises that might discourage a buyer. You want to know about those funny noises. Turn off the radio until you've had time to listen for any noises coming from the engine or the rest of the car. During the test drive, stay focused. Pay attention. Concentrate! You may hear, smell or feel something in the next few minutes that could save you hundreds, even thousands, in repair bills (not to mention the purchase price of the car). Watch what comes out of the tailpipe (black, blue or white smoke). Verify whether the brake, running and turn signal lights all work properly. Verify whether the wheels wobble (if so, the wheels are out of balance). Verify whether the front wheels are in line with the wheels (if not, frame is bent). Verify whether the wheels bounce up and down constantly (if so, shocks are gone). On convertibles, verify whether the top billows and ripples in the wind. 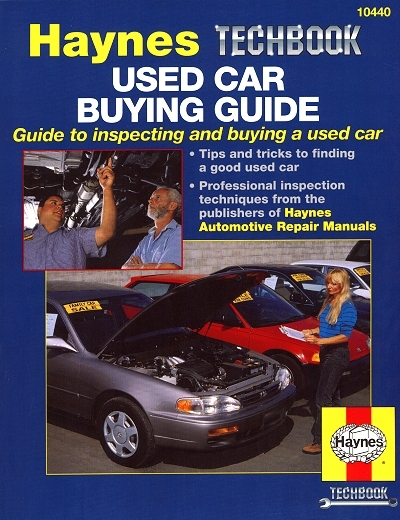 Ask a question about Used Car Buying Guide.